Nonlinear Temporality in Joyce and Walcott is the first dedicated comparative study of James Joyce and Derek Walcott. The book examines the ways in which both Joyce’s fiction and Walcott’s poetry articulate a nonlinear conception of time with radical cultural and political implications. For Joyce and Walcott equally, the book argues, it is only by reconceiving time in this way that it becomes possible to envisage a means of escape from what Joyce calls “force, hatred, history” and what Walcott calls the “madness of history seen as sequential time”. A starting point for the comparisons drawn between Joyce and Walcott is their relationship to Homer. Joyce’s Ulysses is in one respect a rewriting of Homer’s Odyssey; Walcott’s Omeros stands in an analogous relationship to the Iliad. This book argues that these acts of rewriting, far from being instances of influence, intertexuality, or straightforward repetition, exemplify Joyce and Walcott’s complex stance, not just toward literary history, but toward the idea of history as such. 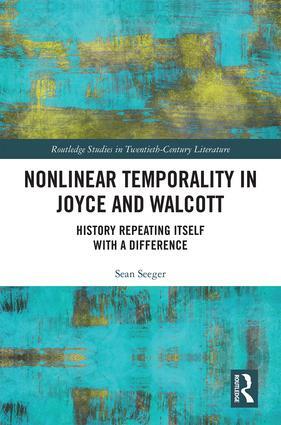 The book goes on to demonstrate how an enhanced appreciation of the role of nonlinear temporality in Joyce and Walcott can help to illuminate numerous other aspects of their work. Sean Seeger is Lecturer in Literature in the Department of Literature, Film, and Theatre Studies at the University of Essex, where he also reg-ularly teaches in Essex's Interdisciplinary Studies Centre. He previously taught in the Department of English and Comparative Literature at Goldsmiths, University of London. Sean's research and teaching focus on modern and contemporary literature, with an emphasis on modern-ism, postcolonialism, and utopias/dystopias. He has been the recipient of research awards from the Arts and Humanities Research Council and the British Centre for Literary Translation, and has published on Joyce, Walcott, world literature, and literary theory.